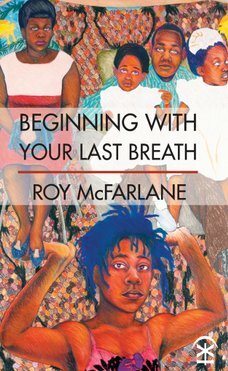 IRR Chair, Colin Prescod, reviews a collection of poetry, Beginning With Your Last Breath, by Roy McFarlane. Roy McFarlane’s reputation goes before him – Birmingham Poet Laureate, Starbucks Poet in Residence, poet in residence at the Shakespeare Birthplace Trust, just some of the accolades garnered. Beginning With Your Last Breath (Nine Arches Press, 2016) is his first full collection of poems to be published. in sofas deep enough to hold to dreams and desires. and Cornish clotted cream scones on a summer afternoon. to the moan of love from a saxophone in the hands of a street busker. to release her from the halls of the Museum and Art Gallery. entangled in the enchantment, consumed by her desires. a wandering soul searching to be whole. She’s homeless but believes, holding on to sweet memories. Love that should never have ben stirred until the time was ready. Beginning With Your Last Breath by Roy McFarlane (Nine Arches Press).